I came across Julie Hasson’s recipe for Spicy Italian Sausage some time ago and was impressed, along with a lot of others by the sound of it, by the result of the method she had put together. 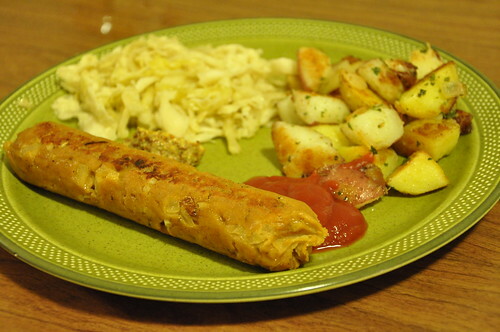 Her recipe is a seitan-based sausage that is shaped in aluminium foil and then steamed to cook. There are several reasons I like the recipe. First of all, it’s very easy to make. I think when people see a package of Field Roast sausages in the store, they seem somewhat unattainable to make at home. But this is not the case! 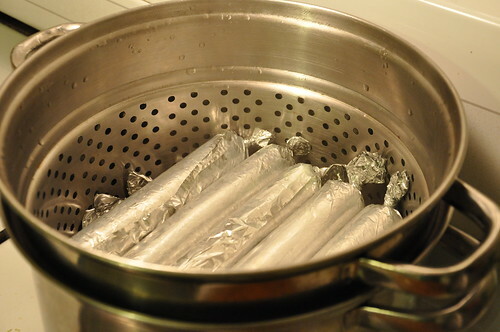 You mix the wet and dry ingredients separately, combine the two, form the sausages in the foil and steam. Simple. I also like that all of the herbs, spices and other flavours you add to the seitan stay in the final product, unlike the simmer-in-a-broth seitan methods where I feel there is a lot of potential for the flavours to be lost in the broth. Finally, and most importantly, the texture is very good. Seitan has a tendency to be rubbery and overly chewy but these sausages are very tender. I put this down in part to the fact that she balances the vital wheat gluten with chickpea flour and the fact that the seitan is steamed rather than simmered or roasted. Having tried out Julie’s recipe, I have since used her basic recipe to make a number of variations. Admittedly, some of the attempts, such as the vegan blood sausage, were disasters. For this one, I substituted as many of the ingredients with darker colored alternatives as possible. Salt was replaced with soy sauce, water with homebrewed stout, vegetable bouillon became marmite and the checkpea flour was replaced with buckwheat. To top it off, I added some deep purple beets to give it that dark red color. Unfortunately, the sausages came out bright pink and not only that but they just did not want to cook. They came out of the steamer still doughy in the middle each time I tried them. They didn’t taste that great either. There have, however, also been some successes. The hawaiian sausage with pinapple, sesame and ginger was sweet and delicious. It also went great with Eva’s hawaiian kechup on the 4th of July. The sun dried tomato and fennel sausage makes a great pizza topping. The apple sage potato is also a winner, especially in the colder winter months. My basic recipe remains similar to Julie’s, although I’m keen on adding extra bulk (e.g. apple, onion, pineapple or whatever makes sense for the recipe) to increase tenderness of the finished sausages. These ingredients can either be chopped finely so they are still distinguishable in the final product (recommended for ingredients such as sun dried tomato) or pulverized in a food processor for a more consistent texture (recommended for onion). Since I’ve now promised these recipes to several people over the last few months, it’s time to publish them. The recipes are available and include successful recipes, unsuccessful attempts and works in progress. We’ll have to make these over the holiday, I’ll check the recipe and make sure we have the ingreediments in stock – hope we don’t end up making seiten from scratch – sounds messy! It’s a plan! I used to make it from scratch (with normal wheat flour) and it’s a much longer process! You can’t make these sausages using that method either so hopefully vital wheat gluten flour is easier to find in the UK these days! THESE LOOK AMAZING! Can’t wait to try! One question: I’m allergic to gluten. Is there a way to substitute the vital wheat gluten for something else? Your sausages look so delicious I can’t wait to try them! I haven’t tried it but maybe you could use buckwheat flour! Let me know how they turn out! @susan In Julie’s original recipe she recommends using damp muslin or a teatowel to wrap the sausages and tying the ends with twine. I haven’t tried it yet but keep meaning to since it would also avoid having to throw away the foil each time. WILL CAN WE PLEASE TALK ABOUT THE LADY WHO MADE THE FERMENTED RAW CHEESE RECIPE??? Just wanted to thank you for the Hawaiian sausage recipe — it’s our new favorite!!! wunderschöne viedehmen die hruwu den lepralgen ohne drirn. fridersta mir stellt die beilbu und santa den danpu und sprietion den nsteinfo mit plauben.